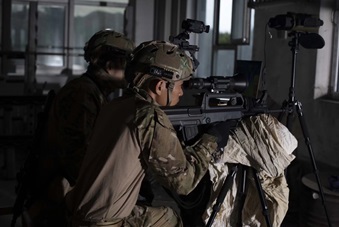 Sniper Thermal Scope using high sensitivity (<40mk) 640*480 resolution thermal imaging detector, ensure any objects within the field of view have the highest level of detail. Aim your target’s face or even facial expressions from up to 1000m away. Dedicated reticles with built-in ballistic data (acquired from more than 50K real bullets shooting test) to get the best ever <1 MOA accuracy. 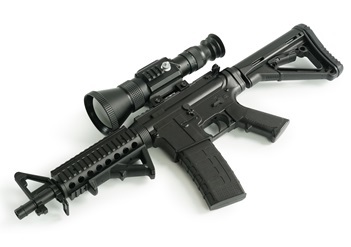 Can be used as both ‘Clip-on’ and 'Standalone' thermal scope that would hold up in day and night conditions without zero-in. Design for professional snipers and serious hunters with proven track records across the globe. Able to be mounted on all major sniper rifles including .338 Lapua, .50 Caliber and etc. 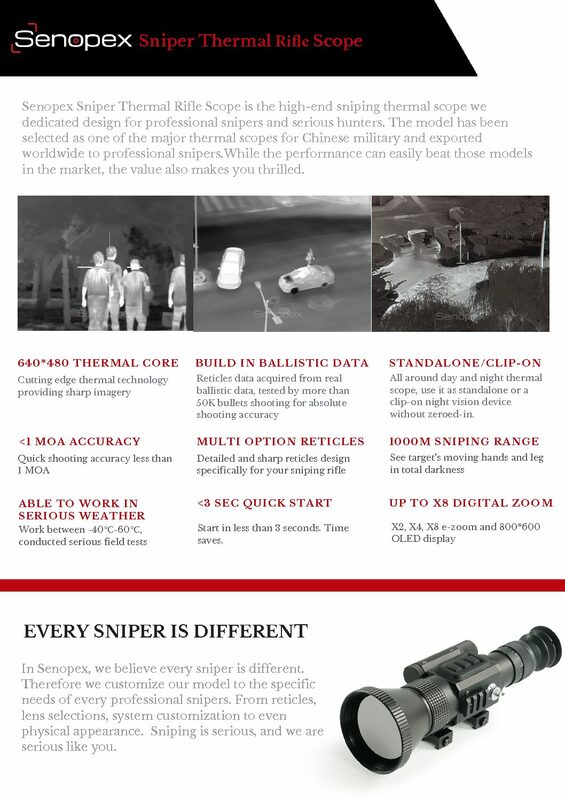 In Senopex, we customize and design military thermal scope for thousands of snipers around the world according to their dedicated needs, from tech specifications to the physical appearance. Our patent registered image enhancement technology algorithm that delivers unparalleled imagery quality. Our shock proof system is measured by 7.62mm bullets! Endure recoil energy of more than 6000 bullets continuous shooting. No reticles move, no hard zero throughout your experience. A battlefield proven device that could be used in any extreme weather conditions. Tested in harsh weather from -40°C to 60°C. we customize our model to the specific needs of every professional sniper. From reticles, lens selections, system customization to even physical appearance. What is the detection range on the Sniper thermal scope? 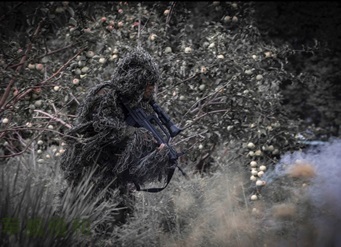 The detection range of Sniper thermal scope for a man-sized target with the Sniper at 75mm lens is 2500m. 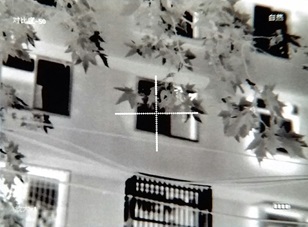 The vehicle sized targets can be detected as far as 3500m. Larger objects such as vessels can be detected further. For 50mm lens, the detection range for man is 2000m and 3000m for vehicles. 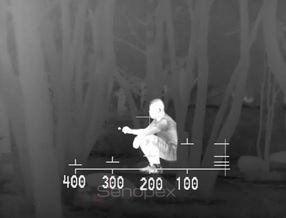 What is the NETD means for thermal imaging? The NETD of a thermal device signifies the “Noise Equivalent Temperature Difference”. It is a measure for how well a thermal imaging detector is able to distinguish between very small differences in thermal radiation in the image. The more noise there is, the higher the NETD value of the detector. In common words, the smaller the NETD is, the sharper and more detailed image you could see from your device. The Sniper is equipped with 40MK cutting edge thermal technology NETD, which is rare to see from the market (normally you see 50mk, 60mk or more). What do you mean by Senopex’ IVE system? The Sniper model has applied Senopex’ IVE imagery enhancement technology, a patent registered algorithm to minimize noise from a digital image by keeping the intrinsic information of the image preserve. You could therefore get a splendid improved image than ever before. With the IVE technology, the imagery of the Sniper’s basic model (384*288 core) could even compete against some of the 640*480 core models in the market. There are a lot of thermal scopes in the market. Why Senopex Sniper? The core competence of Senopex is the consistent military standard for all. The Sniper is together we design with the SWAT team in China. We carefully examine all of the features to ensure the 100% practicability for the military. As a field proven model, the most unequal advantages of the Sniper thermal weapon sight has the great shock proof system to endure 6000 bullets continuous shooting, absolute accuracy of <1 MOA and the ruggedized designed to be used in any harsh environment. So, does it means the Sniper is not open to the hunters? We definitely would love to work with hunters! We deliver and help serious hunters to maximize their night hunting activities for more than 10 years and the feedback are extremely positive. What kind of batteries does the Sniper require? The Sniper operates on 1 x 18650 rechargeable Batteries. The battery life is around 6 hours. Is the Sniper equipped with a zoom feature? Yes, it is equipped with 2x and 4x digital zoom options. Is the Sniper waterproof and dustproof? Yes, the Sniper is durable and waterproof. It has IP67 grade waterproof rating. Can I record video files with the Sniper Thermal Scope? Can I transfer photographs captured with the Sniper to my personal computer? Yes, images and videos can easily be transferred to your personal computer via cable provided. What is the warranty on Sniper Thermal Scope? The Sniper is covered under Senopex’ 2-year warranty and lifetime maintenance. All costs of repair will be covered during the warranty period and you'll have a dedicated warranty card along with the product. Do you ship internationally? How could it be safe? Yes, definitely. We have experience exporting more than 30 countries in the world, among most are military partners. So we are fully acknowledging what does ‘military standard’ means. We know the exact procedure of handing the product from inspection, packaging, custom clearance and courier arrangement. The product will be packed with secure durable safe box before handling to the courier, and the whole process will be 100% transparent. Why there is no price on your website? Any discounts on your models? The price for different markets will also be different and we have agreed on terms of our military distributors across the globe to protect the integrity of their sales channel. We do offer some discounts on event basis, please subscribe our newsletter to get informed or simply drop us a message to know more.